You may be handy around the house but there are some things that may be better left to the professionals. 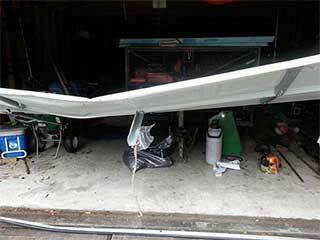 We hate to think of the dangers that a garage door can cause. In addition to causing harm to someone who isn’t skilled at repairing or installing a garage door, they could also damage any nearby property. Some homeowners prefer to handle certain matters around their home by themselves, in order to save money. What they do not always realize is that it may actually cost them more if they do not know what they are doing or if they do something that affects other parts. Your garage door may appear to be an easy thing to repair when something is off. However, with all of the many moving parts involved in its operation, it can be dangerous for anyone to handle without undergoing the proper training and using professional tools. Garage doors often require being disconnected in order for repairs to take place. If a homeowner is not familiar with how to correctly do this, they run the risk of the door suddenly falling on top of them. Even if the door starts to fall and they are able to catch it mid-way, some harm and damage is still likely to occur, especially when it happens unexpectedly. Springs are wound up tightly so that the doors will have some control while they are being lifted. However, over time and with continued use, the springs begin to accumulate wear and tear damage. They will begin to loosen the longer they are used. Since they are so tightly wound, when they need to be repaired or replaced, knowing how to properly unwind them can save you from serious harm. A broken spring is one of the repair jobs that require the doors to be disengaged. Only a trained professional should be called in to handle these types of repairs. The skilled and experienced technicians we employ are capable of taking care of any garage door repair or installation needs you may have. Call us today.